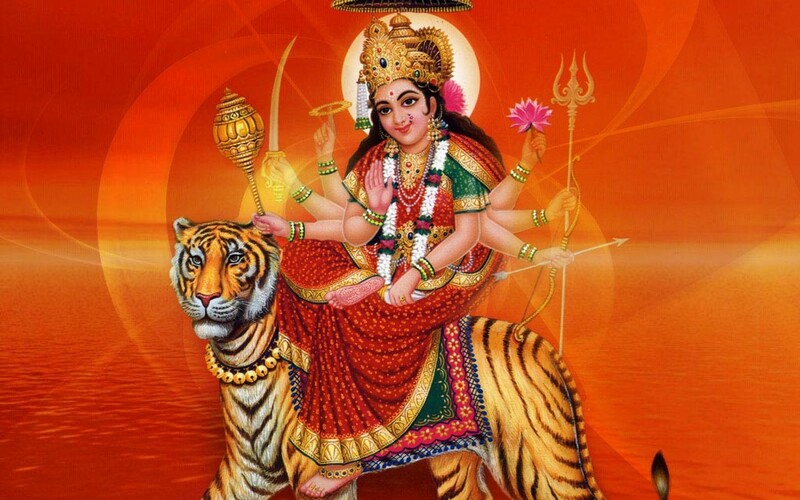 Mata Vaishno Devi is a form of the Hindu goddess Durga. According to legend a young girl Vaishno was created by the Gods to fight the demons in the Treta yug. According to common Hindu religious belief Mata Vaishno grants the four important boons of righteousness, material pursuits, contentment and enlightenment to all those who visit this sacred place of worship. Usually devotees offer coconuts, dry fruits and red net scarves as a token of worship to the deity. The shrine as mentioned above is located in the Trikuta Mountains. Once at the entrance to the cave; the path turns into a narrow tunnel with a cold stream running through it. This stream is called the Charan Ganga. There are rock cut idols of three deities inside the cave, viz. Mahakali, Mahalakshmi and Mahasaraswati. These idols have crowns made of gold and silver. The magnificent Raghunath Temple is situated in the center of the city of Jammu and is surrounded by other temples dedicated to the different gods of the Hindu mythology. The region is populated by the tourists and the devotees who flank the temples to offer their prayers. Built in the 19th century by the Dogra rulers, the splendid architecture of the temple and its gold leafed interiors makes the temple an essential part of the Jammu and Kashmir pilgrim tourism. The construction of the historical temple, positioned in the city of Jammu, was started by Maharaja Gulab Singh in the year 1835. The temple construction continued under the patronage of Maharaja Ranbir Singh and was completed in the year 1860. The architecture of the temple reveals an influence of the Mughal style. The temple is dedicated to the ancestral deity of the Dogra rulers, Lord Rama. The premises of the temple comprises of seven shrines embellished with a number of idols of the different Hindu gods and goddesses. The galleries of the temple are adorned with a huge number of Saligrams. The chief shrine comprises the stone idol of the Lord Rama. The interiors of the sanctum are decorated with gold. The temple also consists of the Sanskrit Library, which houses the ancient manuscripts of the region. The portrait of the patron, Maharaja Ranbir Singh is placed in the entrance of the temple. The temple is situated on the Shalimar Road in the city of Jammu. Built in the 19th century, the magnificent temple is flanked throughout the year by the devotees who gather in large numbers to offer prayers to the reigning deity of the temple. The temple was built by Maharaja Ranbir Singh who is one of the ancestors of the Dogra rulers of the state of Jammu and Kashmir. The temple is dedicated to Lord Shiva who is a part of the holy trinity of the Hindu mythology. The construction of the temple was completed in the year 1883. The premises of the temple are divided into two halls decorated by images of the gods Ganesha and Kartikeya. The idols of the faithful Nandi Bull is found in the temple. 1.25 lakh bona lingams of the Lord Shiva are placed in the two halls of the temple. The characteristic feature of the temple is the 7.5 feet tall Shiva lingam that is placed in the main sanctum of the temple. The main limgam rises in the center of the temple and is of black marbled stone. The temple also has 12 other lingams carved out of crystal ranging from 15 centimeters to 38 centimeters in height. With the magnificent 7.5 feet lingam, the Ranbireshwar Temple is one of the most popular Shiva temples of north India. Situated near the New Secretariat, it is well connected to the rest of the city and to the other parts of the state. This holy cave is nearly a kilometer long and houses a 4 ft high, naturally formed ‘Shivling’. It is considered second only to the shrine of Mata Vaishno Devi in religious importance. There are stalactites and stalagmites dripping milky limestone water. To the left of Shivling Mata Parwati is symbolized by impression of Her Holy feet. Kartikeya is also seen in left of Shivlingam. At nearly 2.5 feet above, five headed Ganesha is can be seen. The Holy cave has a number of other natural images which are believed to be that of 33 crores Hindu Deities. The cave roof is etched with snake like formations, the water trickles through these in the cave. ‘Three pronged lance’ depicting the Trident (Trishul) of Lord Shiva and ‘Six Mouthed Sheshnaga’ are also seen on the roof of the cave. The main portion of cave roof has round cutting mark signifying construction of cave by Sudarshan Chakra of Lord Vishnu. Believed to be 2800 years old, the temple of Sudh Mahadev houses a natural black marble Lingam, the Trident (Trishul) of Lord Shiva and mace believed to be that of Bheema, one of the five legendary Pandava brothers. This holy temple near Patnitop is situated at an altitude of 1225 m and is about 120 kms from Jammu.Sudhmahadev has a spring by the name Pap Nashni Bowli. It is believed that taking bath in it relieves a devotee of all sins. After bath one proceeds towards the holy temple of Lord Shiva. Pilgrims visit the shrine on Historic Sudhmahadev 3 day Festival (Mela) on the full moon night of 'Sawan' (June -July) to worship the Trident (Trishul) and a mace. During this 3 day festival, arrangements are made by the state government administration to provide facilities to the visitors. Adequate transport is also provided by the government agencies from various destinations. The government also ensures security arrangements. Good health facilities are also made available. Cultural programs are organized during the 3 day festival; in which the local performers entertain the visitors by showcasing various local dances and singing folk songs. About 40 kms from Jammu, just off the national highway leading towards Pathankot, is the Purmandal Temple Complex on the banks of the sacred and mostly underground Devak river. Often referred to as 'Chhota Kashi', its main temple is dedicated to 'Umapati', while the other temples worship Lord Shiva. These ancient temples are associated with the Shaivite Hindus of the Kashmir Valley. Regular bus service connects the town with Jammu. Accommodation is available in pilgrim ‘sarais’. A Journey to Eternal Faith (21st - 28th August 2011) - Abode of the mythological serpent God, Lord Vasukinag Ji, the sacred Kailash Kund, located at 16000ft above sea level in Doda District of Jammu and Kashmir, is an enchanted crater lake which remains frozen for a greater part of the year. During late August or early September every year the scenic environs of this hallowed lake come alive to the chants of thousands of devotees who undertake an arduous trek to take a Holy dip in the lake during the annual Kailash Yatra. Believed to be as Holy as the sacred Mansarover lake in China, a dip in the ice-cold waters of Kailash Kund is believed to wash away the sins of the yatries and make their wishes come true. Legend has it that the lake is also visited by Lord Shiva who described it to Mata Parvati as one of the most important pilgrimages of Northern India in the 'Vasuki Puran'. The yatries, while taking the Holy dip, also worship the Lake, Lord Shiva and Sh. Vasukinag Ji. The base town for the yatra is the beautiful township of Bhadarwah cradled in a magnificent bowl-shaped valley of the same name. Affording beautiful landscaped vistas, with mesmerizing natural beauty. Bhadarwah, a veritable paradise, is also aptly known as “Chota Kashmir”. From here the yatra proceeds on the same route, which, as per legend, was taken by Shri Vasukinagji to reach Kailash Kund at the time when Garudji challenged him to a fight. Kalinag Mountain through Deodar forests and stretches of beautiful green landscape to reach Hanvieha. Here, the yatries rest for the night in the vicinity of a spring gurgling with cool fresh water. On the second day, the yatra proceeds further to “Gow Paeda” a rocky mountain which Shri Vasukinagji is believed to have climbed after taking the form of a Cow (“Gow” in local parlance) after which it proceeds up the beautiful slopes of “Ram Tund” to a green valley, atop the slope. Some yatries pitch their tents here while others move on to “Gan Thuck” which provides panoramic views of the Seoj Dhar meadow. Some yatries also pitch their tents at Seoj Dhar while others move on to Kailash Kund for the night. Next day the yatra returns to Bhadarwah, and few days later the township celebrates the colorful 'Mela Patt' which showcases the rich cultural and secular traditions of this bewitchingly beautiful land.